AKG N40 review | What Hi-Fi? With many of us listening to music while out and about, it’s little wonder a market for premium earphones has emerged and appears to be going strong in the sales stakes. After all, why wouldn’t you want the best quality possible at the times that you do most of your listening? There is, however, an issue here: while you might have the best earphones for the job when you’re out and about, do you have the best music player? In fact, do you have a source that’s even talented enough to drive those high-end headphones? 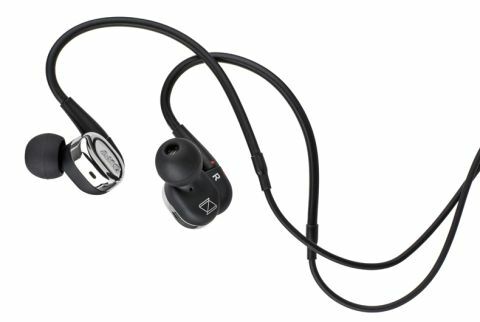 But let’s take a closer look at the AKG N40 in-ear headphones and come back to that later. You might expect a £350 purchase to impress you from the moment you open the box, and the AKG N40 earphones don’t disappoint. The packaging acts almost like a presentation case, displaying the assorted contents for maximum cooing effect. The N40s are smart looking headphones; mostly plastic in construction, but lightweight as a result and made to look fancier with a shiny silver finish. They’re comfortable, too, with the fitted over-ear hooks keeping the buds secure and perfectly positioned to create an effective seal without any discomfort. Those hooks running over your ear also act as dampeners to prevent vibrations spoiling the sound. That’s great for those using these AKG earphones on public transport or any other loud environment. The headphones themselves are only part of the AKG N40 story, though, because the accessories are also key. You get a selection of ear buds in four different sizes, plus a cleaning tool, flight adapter, compact carry case and two cables – one ‘straight’ option and one with a mic and three-button remote that can be used with either Android or iPhone via a little switch on the back. But perhaps the bigger selling point is the fact that you can swap the earphones’ filters to tweak the sound. Installed in the factory are the standard, or ‘Reference Sound’, filters, but you also get tiny pairs of ‘Bass Boost’ and ‘High Boost’ filters that can be swapped-in to give more oomph to the bottom or top ends. This is nothing new. Around a year ago we reviewed the £45 Rock Jaw Alfa Genus earphones, which took the very same approach. And we remain unconvinced by the concept. If you like bassy headphones, buy bassy headphones. If you want trebly headphones, buy trebly headphones. If you want good, honest neutral headphones… well, you get the point. Once run-in, the AKG N40 in-ears with the Reference Sound filters installed sound rather fantastic – when driven by a suitable source. Listening to the earphones plugged directly into an iPhone or Samsung Galaxy S7 (or even a MacBook) - gives you a rather flat and unengaging sound with a treble that is rather hard and incessant. Rated on this performance alone, the AKGs wouldn’t be getting a five-star rating, but bolster your source with a DAC, such as the Audioquest DragonFly Red, and the N40s spring into life. Play Radiohead’s Burn the Witch and the track’s threatening, string-led energy grabs you by the lapels from the off. That spaciousness remains, with Thom Yorke’s haunting, echoey vocals given plenty of room to breathe in the midst of the carefully orchestrated instrumental chaos around it. Switch to Nick Cave and Warren Ellis’ soundtrack for The Road and the AKG’s have the detail recovery and low-level dynamics necessary to deliver the texture and raw beauty of this recording. There’s plenty of weight at the bottom even if you avoid the ‘Bass Boost’ filters (and you should avoid them), but the lowest notes could do with just a little more impact in the leading edge. That treble, conversely, is far less hard once you’ve got a capable source – there are rare occasions that it stands out just a touch, but overall the delivery has great range and impressive balance. The AKG N40 earphones sound great, but they’ll work best for the sort of listener who packs into their pocket not just a phone full of hi-res tunes, but also a decent portable DAC. If that’s you, we applaud your dedication to the hi-fi cause and recommend you give these premium in-ears an audition just as soon as you can.